0 Comments Published by KL Ocs Kid on Thursday, July 5, 2007 at 11:58 AM. 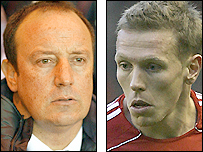 Liverpool boss Rafael Benitez has placed a major doubt over striker Craig Bellamy's future at the club. Benitez has added Fernando Torres to his squad and now has five strikers with Bellamy, Peter Crouch, Dirk Kuyt and fellow new signing Andriy Voronin. Asked, at the unveiling of Torres, if he was happy the player was at the club and part of his plans, Benitez said: "Are you talking about Torres?" Told Bellamy was the subject, he said: "I'm really happy with Torres here." He added: "We have some clubs asking about Bellamy and it's a possibility. "He knows my idea. He is our player at the moment and we will see what happens in the future. "It is clear we have new players here and then it could be more difficult for some of the players. "The only thing I can say is that Crouch will be staying with us. I have said to Crouch that he must fight for his position and he will stay with us." Striker Djibril Cisse is already close to the exit door as he is set to be sold to Marseille. Benitez played down a move for Manchester United left-back Gabriel Heinze and instead insisted he was trying to sign new wingers. The Reds boss believes he needs to add to the signing of Torres to help his side challenge for the Premiership title. "It is clear we need to improve to be contenders. You will ask if we can fight for the title with Torres. I think we need something more," he said. "It is clear we will improve with Fernando but if we can find other players good enough I think we will have better balance. "When you talk about the Premier League you talk about nine months and you need a big squad. "We have some names. We are especially looking for wingers."